French President Emmanuel Macron made a joke denying that he’s in a relationship with another man for the second time. So why are some outlets making it seem like he could be a closet case? Last year, before the presidential election, Macron denied having an affair with a male radio executive in response to rumors that were started by Russian media. Now he joked that he’s not having an affair with his bodyguard Alexandre Benalla. Benalla has been at the center of a major scandal about police violence in France. Video of him hitting, restraining, and pulling a young man and a young woman during protests that occurred on May 1 surfaced last week. Benalla is not a police officer, but he is seen in the video wearing a helmet and working with law enforcement officers. Benalla has been taken into custody on charges of violence in association with others and committing acts reserved for public authorities. Three police officers were suspended for leaking surveillance video to Benalla, and he is also charged with possession of stolen images. While several videos of the incident have been floating around the internet since May, neither the media nor the Macron Administration cared much about this instance of police brutality. It wasn’t until July 18, when Le Monde was able to identify the man in the helmet as Benalla and another man in the video as Vincent Crase, who works for the president’s party, that the incident became a scandal. 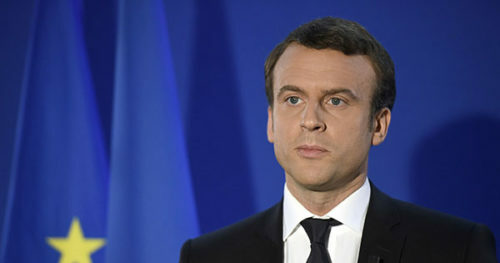 The Macron Administration gave contradictory statements about who authorized Benalla to work with the police to suppress the May 1 protests, and newspapers reported unconfirmed facts about Benalla, like that he received a giant, free apartment in one of Paris’s most expensive neighborhoods and that he was paid 10,000 euro a month (about $140,000/year). Macron himself finally addressed the rumors at a party meeting yesterday. “Alexandre Benalla was never given the nuclear codes,” Macron said to general laughter, making light of the latitude his critics have accused him of giving Benalla. “Alexandre Benalla was never my lover,” Macron joked. Last year, Macron responded to gay rumors promulgated by the Russian government-controlled journal Sputnik. He joked that he did not have a “double life” with Mathieu Gallet, the president of Radio France, but that a hologram of him escaped.